UPDATED: Terror Plot Uncovered In Texas? This entry was posted on Wednesday, October 19th, 2011 at 10:00 and is filed under News, Terrorism, War. 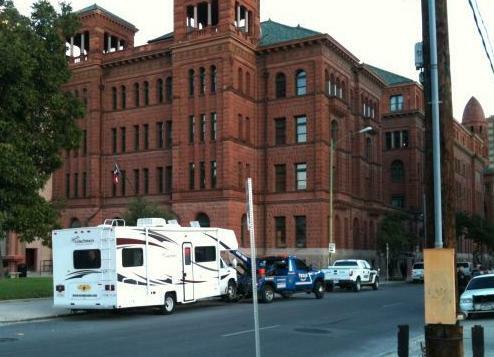 Five men were apprehended early this morning in the Bexar County Courthouse in downtown San Antonio. The five men were described as being French-Moroccan Muslims, here in the US on visas having traveled to the US from London. Law enforcement officials who asked not to be identified told radio station 1200 WOAI “They got travel documents, parking passes, they have been all over the country.” Apparently, the men arrived at the courthouse in a van found parked in front of the building, and it contained photographs of infrastructure, shopping malls, water systems, courthouses, and other public buildings from around the nation. It’s clear that the men were on some sort of nationwide reconnaissance operation. “All that, coupled with the fact why they can’t explain why they are in the building at 1:22 in the morning raises questions,” the law enforcement officer said. Ladies and gentlemen, while all our attention is on the Occu-pests, their buddies in the Islamist movement are running rampant. To top all of this off, an airliner was forced to land in Amarillo, TX because a man aboard a Southwest Airlines flight from Los Angeles to Kansas City began shouting “You’re all going to die. Allahu Akbar – you are all going to hell!” The man, a US citizen, was taken into custody by police who met the plane at the terminal. One official on the scene characterized the man as having “lost control of himself,” and dismissed it as unrelated to terrorism. What? Ladies and gentlemen, if a muslim male aboard an airliner begins screaming all of those things in the bathroom at the rear of the plane, causing the plane to make an emergency landing, it is an act of terrorism. I can guarantee you that every other person aboard that airliner was terrorized by his behavior. This is another example of political correctness gone mad, as what is clearly a serious incident is being related to the American people as merely a routine nuisance. We had better wake up. We’re being set up, and the thugs have our number. They create distractions, hide their operations behind the distractions caused by others, and all the while, this is going on behind the scenes. We may be witnessing the wind-up to a major attack on the US, and we’re messing around with a bunch of ne’er-do-wells who are creating distractions and drawing law enforcement resources away from incidents like the reconnaissance mission in San Antonio. Update: Was This Arson Case an Act of Terrorism? 6 Responses to UPDATED: Terror Plot Uncovered In Texas? And Ron Paul wants to shut down the TSA? Dave, To be honest, I am not entirely sure that the TSA provides us any better security than we had before it existed, if for no other reason than some of the cases that have happened since. They've failed a number of test runs at a number of airports, so I'm not convinced creating another government agency has bought us all that much security, truth be told. I'm no fan of Ron Paul, but the TSA is a joke! They're too busy harassing Americans to spend much time watching out for Muslim terrorists. (That would be too politically incorrect for them to do anyway!!!) Several months ago there was a report out that an undercover federal agent sent to test the TSA's security managed to get onto at least 3 different planes at 3 different airports without being stopped, all while carrying a loaded handgun! The TSA isn't making anyone any safer. It is just showing the Muslim world that we're willing to sexually assault our own people out of fear of them, but, due to political correctness, we're unwilling to actually do anything that might focus our attention on the actual threat. BTW, it also shows them that they are winning!!!!! Seems to me the guy on the plane made a typical (and characteristic) terrorist "statement of intent" So does it matter that he was later found to not be equipped to carry it out? He could have been wearing "novelty nappies" or "booster boots" – of the very type provided by that other proven terrorist and "American Citizen" – Al Awlaki. That Aussie kidnapper that strapped a bomb onto a girl, is he innocent just because it was a fake? Or a robber with just his hand in his coat pocket and making it look like a gun, is he by definition well-intentioned, harmless and generous, even though he is actually making demands and threats of violence? Now, Boston's Mr. Jabar, the idea that he was trying to commit suicide is interesting, in that all his 9/11 co-religionists were doing the same. Ditto every car-bomber. The only genuine muslim suicides are the 2400 Afghani women that set fire to themselves every year due to the abuse they suffer daily and their utterly hopeless situation under sharia. And as for the 5 Moroccans – if it smells like pig and roots like a pig and wallows like a pig and is the child of a boar and a sow, (to quote the Great Telepromted One) it doesn't really matter if you put lipstick on it . . . The Mainstream media do not want Americans to know that their nation is in peril. They are deliberately not putting reports of this type out there because they like the idea of an Islamic America. They agree with their hero Hitler that it would be easier to make war while ruling over "Mohammedans" than ruling over "Christians". They preach "peace" but Worship a god of "force".